Bell Island is located in Conception Bay, on the northern part of the Avalon Peninsula. The island is about 9 km long by 3 km. wide, and is serviced by a year-round car and passenger ferry across "The Tickle" (the body of water between the island and the community of Portugal Cove). As with many places in Newfoundland, the first settlers on Bell Island lived primarily by fishing and farming. Farming was particularly important, owing to the island's unusually rich topsoil. Throughout the nineteenth century, the seal hunt drew large numbers of men from Bell Island and all around Conception Bay. The Pitt family opened a brickyard on Bell Island in 1848, and the Rees family operated a shipyard on the island, in Lance Cove, for a period during the 1800s. Reports of iron ore on Bell Island go back to at least 1578, when a merchant from Bristol, England, reported finding iron deposits there. In 1628, members of Sir John Guy's colony in Cupids sent iron samples from Bell Island to England for analysis. The colonists apparently thought the ore was valuable for they tried, unsuccessfully, to have the deposits added to their colony's property grant. It was not until the 1890s, however, that the Bell Island deposits drew serious attention from professional mining interests. 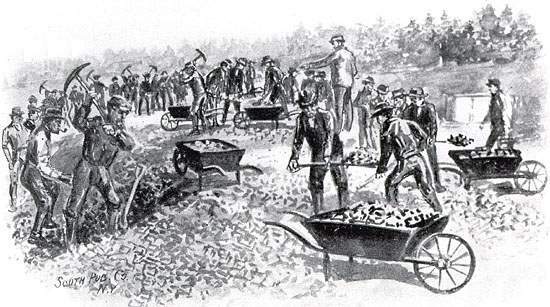 By 1892, the deposits had come under control of the Butlers of Topsail, who brought in agents of the New Glasgow Coal, Iron and Railroad Company (later called the Nova Scotia Steel and Coal Company) to begin developing the site. Thomas Cantley, Secretary of Nova Scotia Steel and Coal, called the minesite "Wabana", which is believed to be an Abenaki Indian word meaning "the place where daylight first appears", and mining began in the summer of 1895. Reports of iron ore on Bell Island go back to at least 1578. Drawing by South Pub. Co., NY. From M. Harvey,	Newfoundland in 1900 (St. John's, Nfld. : S.E. Garland, 1900) 185. The Wabana ore deposit was vast, of high quality, and close enough to the Cape Breton Coal fields to feed the giant steel mills in Sydney, Nova Scotia. Bell Island ore was also shipped to more distant parts of the world, such as the United States and Germany. The iron mines drew Bell Island into the international network of the mining and steel industry, and over the period of mining operations (1895-1966), distant powers and events shaped much of the history of the mines and of the island itself. In 1899, a second company joined Nova Scotia Steel and Coal when the Whitney Company (later called the Dominion Steel Corporation) purchased rights to the large "lower bed" of ore that lay under the Scotia company's "upper bed". Both of these beds ran under the sea floor of Conception Bay, and after surface mining had exhausted the easily accessible ore, workers began the giant task of reaching and extracting these submarine beds. The submarine slopes were begun in 1905, and the Nova Scotia holdings were reached in 1909. By 1911, Nova Scotia Steel and Coal owned about 32 square miles of submarine beds, while the Dominion Company held about 8 square miles. By 1951, miners were working three miles out under the sea. The minimum allowable mine ceiling - in this case the minimum thickness of the sea floor which formed the roof of the mine - was 200 feet. In some places, it was up to 1600 feet. While operations for the most part seemed to run at a steady and at times an expanding pace, there were periodic setbacks. The outbreak of the First World War, for example, was a serious blow, since Germany had been one of the chief consumers of Bell Island's ore. The occupation of Germany's highly industrialized Ruhr Valley by France in 1923 had a powerful effect. A decade after the end of the War, the Great Depression undercut both the demand for iron ore and its price. The period from 1936 to 1959 saw steady recovery. Although one of the mines was shut down in 1950, leaving three in operation, mine modernization projects seemed to spell prosperity. In 1959, however, another mine was shut down and in 1962 one of the remaining two was closed. The final blow came when Number Three Mine was shut down in April of 1966. At the time of its closure, Bell Island was Canada's longest continually operating mining project. Since the mines opened, 78, 989, 412 tons of ore had been shipped, to Canada, West Germany, the United States, Belgium and Holland. Until the 1950s, Bell Island was the sole source of iron for the Sydney steel mills. Mining on Bell Island began in 1895 and ended in 1966. Courtesy of The Rooms Provincial Archives Division (A24-15), St. John's, NL. What went wrong? There are a variety of inter-related answers. Ironically, modernization in the 1950s may have contributed somewhat to the mine closures. New technologies and new mining methods often mean that ore can be brought out faster and cheaper than was previously possible, and once the accessible, high-grade ore has been extracted, companies often find it cheaper and easier to simply move on. Certainly, international competition played a part in the Bell Island saga. Sydney steel interests had been going to Labrador and Venezuela for ore in the years leading up to the mines' closure. Other places in South America and in West Africa were also competing with Bell Island for a share of the iron ore market. Another problem, which is common to mining and other major industrial enterprises in Newfoundland and Labrador, was the absence of any local ownership or control of the operations. Ownership of the Bell Island mines changed hands many times over the years. In 1920 the British Empire Steel Corporation (BESCO), a conglomerate of mining, manufacturing and transportation interests, absorbed both of the original Bell Island mining companies. By 1926, however, BESCO was bankrupt and its holdings were taken over by National Trust, a firm to which BESCO owed a massive debt. In 1930, the Dominion Steel Corporation (DOSCO) bought out BESCO's holdings, but by 1957 internal feuds between DOSCO shareholders resulted in more difficulties and A.V. Roe Canada (later Hawker Sidley Canada) took over the mines. Through it all, one factor remained constant: the Bell Island mines were always owned and controlled by outside interests. In many instances, such parties have little or no interest in the long-term fate of the local people or the local economy. For them, a mine is first and foremost a way of generating profits for often distant shareholders. Local governments often cannot or will not do anything to avoid the kind of boom-or-bust cycle that such enterprises create, and will often, especially in places such as Newfoundland and Labrador, sacrifice long-term planning and development for jobs. In one sense this is understandable. Mining is an expensive undertaking, and when not enough start-up capital can be generated locally, outside capital is usually sought and brought in. Too often, however, this ultimately leads to the situation which eventually arose on Bell Island. Finally, as has already been mentioned, the fortunes of the Bell Island mines were also often linked to economic and military events thousands of miles away. Within the context of economic diversification the Bell Island example, like others in Newfoundland and Labrador, clearly shows both the benefits and drawbacks of mining as a form of industrialization. When the Bell Island mines opened in 1895, they were correctly described by the Newfoundland government as a major step in developing the resources of the island. Over the ensuing decades, Bell Islanders and many others reaped the benefits of the enterprise. However, for Bell Island, as elsewhere, the move away from a small-scale, diversified local economy based on a number of industries, toward a single-resource economy based on an industry which extracts and exports a non-renewable resource, carries with it obvious consequences. Since the closure of the mines, many people have left Bell Island, but many have remained. As of 2011 approximately 3,000 people lived on the island, many of whom commuted to St. John's on the daily passenger and car ferries that run across The Tickle. Bell Island still has its schools and churches, and a variety of other institutions. Since the mines closed, local people have tried in a variety of ways to generate economic activity. Tourism is one important part of this attempt. Buildings on the island display a series of large murals depicting various facets of mining history, and the No. 2 mine has been reopened for underground tours during the tourist season. There has been some talk of using the vacated shafts for non-mining purposes, such as storing crude oil. There are still, reportedly, vast bodies of iron ore remaining, but to date no company has made a serious attempt to re-open the mines.